I'm very happy with how this has turned out, especially given that it has caused a few headaches along the way. I know I set this challenge, but it didn't really feel like that as I was working on it - there were definitely one or two moments when I wished I'd suggested something easier, or hadn't felt the urge to make those big log cabin blocks. But sticking with it was good for me. Working with the bigger pieces took me a bit outside my comfort zone, and figuring out how to combine them with the triangles taught me a lot: who knew that the triangles would read as the quiet spaces? Now I just want to quilt it, but there is still a backlog so I'm going to take a week or two off piecing (mostly), mull over possible new projects and put in some extra hours with my needle and thread. A quick general note about these challenges: we have working on the theory of one every three months, just because that seemed manageable. But, and I can't emphasise this enough, you are welcome to link any (improv) project at any time. I know some people are still working on the first challenge and that's fine. Others have already done a piece for the second challenge and that's fine. Still others have improv pieces that are not a response to a challenge at all and that too is fine. If you've done something you want to share, just go ahead and link. I love it! Congratulations...really like all the pathways connecting the log cabins. It reminds me of a city map...so worth all your effort! So many aspects to admire. Love the variation between large and tiny housetops, the many triangles, the turquoise cast to the background, the summery color scheme, and the use of old shirtings stand out. The two-block scheme makes this quilt more open and lively than many with housetops. Congratulations on an original, exciting quilt. It looks great, Kaja. Your long deliberations always pay off, and it is fun to be taken through your thought processes. I am an impatient worker, and rush to the finish line. Then, sometimes I'm not quite satisfied. I appreciate the permissive words about posting these AHIQ projects, too...I still have not one, but two unfinished pieces from the first challenge, loitering in the UFO basket. They will be posted if and when I finish them! Cheers. Off to a busy day, but coming back later to see what everyone else has done! Kaja, it is a such a charming quilt. The contrast between the soft colors and the brighter reds is an excellent balance. The variety gives one so much to look at, like the triangle strips and the red stripes. Congratulations on a well done top. All that thought and time paid off. You must be delighted. There's so much fun energy in your quilt, Kaja. Your arrangement is perfect. Thanks, Kaja and Ann for hosting AHIQ, great idea. You got it done and it looks fabulous! It has balance, movement, variation of scale and color. I give it a thumbs up! Good job! Oh I did smile when I saw your pic, a quilt on the washing line always gets my attention. Then on looking closer, it's such a fabulous finish! There's an overall balance and a real vintage-y vibe from those shirts that I so love! So much fun following your progress on this too! I've really enjoyed watching you construct this quilt. The end result is stunning. Such creativity! I've shared 3 links - two for the Dumpster Diving quilt top(s) that happened as a result of last month's link up post and another for a new two-block (and then some) quilt that is very much in the making right now. I LOVE LOVE LOVE your quilt top, Kaja! That looks incredible, Kaja!! I know the triangles were a lot of work, but they add so much interest to quilt beside the large log cabin blocks. They look like bunting. The quilt reminds me of a fair in a seaside town. Oh my goodness, when the picture of the quilt first pulled up, I actually caught my breath! What a beauty! Love how those little, tiny triangles add so much energy. The lighter stripey pieces were pure genius too! Really wonderful finish Kaja! Oh I really really like this one!! Just so pleasing to the eye. Wonderful finish. When I saw the first pics of your new quilt I really couldn't imagine how it will develop. But as usual you made it in a surprising way. Wonderful harmony of colors and patterns. Thanks that you let us follow your work and share your thoughts. What a pleasing quilt. The colors go together so well and the design keeps me interested in viewing it leisurely (is that a word?). Nice job! Bravo! This is such a successful two-block! I know I've said it before--I really like the effect of the triangles, but seeing the whole thing now, I also like how the minty green in the "background" of the triangles anchors and calms the whole quilt. I can't believe I have no improv to share this month. Chasing squirrels and then putting everything away for the past to weeks for guests made the month fly by. I'm glad I won't be marked down for a late project. :) I can't wait to see what the next challenge is. What a great finish Kaja!! Splendid to see this quilt stitched together and enjoy your well earned break from piecing for a while! What will you be quilting? It looks great! And those triangle parts are really the quiet part, I guess it's all relative. Congrates on the finish! You certainly successfully met the challenge of a two block quilt. It's wonderful - very pleasing to the eye. Congrats. Is there a new challenge planned for August? Wow, what a wonderful quilt! It came out great! I really, really like this quilt. Love the colors, the log cabins with that red, and the lovely, soothing blues and green make this quilt look like a summer day. You did a fantastic job on this one! I love how the little triangles are subdued but also add so much to the overall look of this quilt. Congrats! 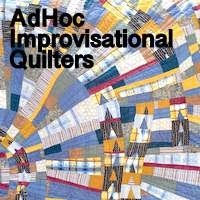 I don't think I realized how much of the soft blues you have in the quilt. It's much calmer than I've been thinking. Of course, those log cabins add tons of zing, especially the bigger ones. But if you pay attention to the smaller and the partial log cabins, you have to slow down and explore a bit. Figure out what's going on. That's my favorite part. Yes, even though I said before that I especially like the triangles. That's the problem with your quilts, they keep me questioning and going back and rethinking. Maybe that's my favorite! Ha! This quilt top is gorgeous!! I love it!! I love how this has turned out; it makes me want to finally start on quarter log cabin blocks. Unfortunately there's a backlog to be dealt with first. I brought this on myself!